Genpak compartment lunch trays are second to none in quality and functionality. With five and six compartments, our school meal trays are durable and secure enough for hot and cold foods. 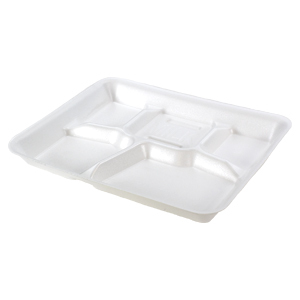 Our trays are ideal for cafeteria and commissary use. Great for separating dressings and sauces from breads and pasta, our lunch trays will help keep your meal fresh and appetizing! Our trays are available in white and sesame for optimal foodservice applications. Length: 22.625" Width: 17.125" Height: 21.375"